This is a Mets Lenny Dykstra autograph, which is perhaps as it should be. Dykstra won a World Series with the Mets, he only played in a Series with the Phillies. The 93 post season is definitely significant in the Dykstra legend - Between the NLCS and World Series Dykstra hit 6 home runs. For his Career Dykstra hit .312 in the post season including 10 Homers in a mere 112 At Bats. Dykstra is a fan favorite in both New York and Philly due to his well earned reputation as a hard-nosed player. His career ended somewhat prematurely due to injuries at the age of 33 - although a high $$$ contract and the financial stakes of both Dykstra and the Phillies were probably also factors. Another aspect of Lenny Dykstra's personality is that he is a man who has been known to enjoy a drink or two. For this reason I chose Lenny to represent STS! with the New Year's Eve holiday looming. Dykstra can also help to serve as a warning too. In May of 1992 Dykstra was involved in a nasty car accident while driving home from a bachelor party for teammate John Kruk. Another Phillie Darren Daulton was injured in the crash. There are countless examples of athletes, celebrities, and our friends, relatives, and neighbors all being affected by mishaps that involve drunk driving, yet we as a society have not learned much from these examples. Everyone enjoy your New Year's Eve, but also do your part to be safe and not endanger yourself or the lives ot others. Many folks know that Dykstra has parlayed his baseball celebrity into a successful stock/business venture and currently writes a column for the street.com. Dykstra's son Cutter was recently drafted by the Milwaukee Brewers and I think he has a card in either Razor or Donruss Threads. Oh and here is a short article that appeared in the Onion referencing Lenny Dykstra. FYI - the Javier/Searcy trade really did happen, but the PTBNL was not Dykstra, it was Julio Peguero, who never did play for the Dodgers major leage club. Once again PTBNL was the first reader in with the correct answer good for a Pat Burrell Double - His last AtBat as a Phil no doubt. The bonus question is still open until after the Rose Bowl. I am accepting entries for the bonus question here until 11:00 AM (eastern) on January 1st 2009. PTBNL - repsresentin those Fightin Phillies - 4 Runs - Burrell on 2nd. For those of you keeping score at home, I missed one of PTBNL's runs last week and had initially stated he only had 3 runs - this has been corrected. Recently the fine folks at Dinged Corners posed a series of Baseball Card Collecting questions. They are always good at coming up with interesting and thoughtful questions for their readers. Today I post my answers to their Qs. 1-If I didn't collect baseball cards, I'd collect Record Albums - good old Vinyl not these new (now old) CD things. 2-My baseball heroes include one you probably wouldn't know from my blog or comments, and that person is Johnny Damon. I have always admired his style of play and recently found out that he is of Thai descent. I, like Damon, also have a Thai mother. Thailand is not a big country and Damon is likely the only player with any Thai background whatsoever to play in the Major Leagues. 3-This New Years I resolve to primarily add to my collection in Odd numbered Months and catalog/organize in even numbered months - in other words, not buy so much stuff in even numbered months. 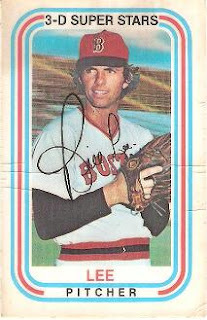 4-If I could spend a day with one person from baseball history, it would be Bill Lee. I always thought of Bill Lee as a thinking man's ballplayer - a little too crazy for 70s baseball. But I am sure he'd be a great guy to party with. Kellogg's put out sets of "3D" cards during the 1970s that could be acquired as prizes in their cereals. There was a related promotion where one could get the entire set by sending in a couple of box topps plus a few dollars. The Sets numbered in the 50s I think, the 1976 set had 57 cards. 1-What is your favorite kind of dog? animals cause me trouble, but I would probably choose Collie, Pug, or Beagles - since those are the only ones I am familiar with. 2-Who is your favorite baseball player? 3-What is your favorite team? 4-What is your favorite baseball movie? 5-What is your favorite baseball book? "Ball Four" I also liked "A Thinking Fan's Guide to Baseball" and "Men at Work". I hope to pick up "Living on the Black" at some point. 6-What is your favorite card? To many to mention - just about any card from 71 topps or any other early 70s set. I am looking forward to any cards that commemorate the 2008 World Series - and will be extremely dissappointed if that aren't any that show game 5 of the 08 World Series. This was enjoyable. Dinged Corners - Keep the questions coming! I recently pulled this from a pack of 2008 Topps Stadium Club. 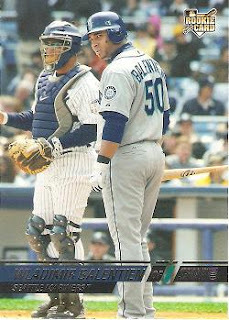 My Question for the Yankees fans out there is, can anyone identify the catcher as Jose "Name that Molina" Molina? I am pretty sure I was at this game - The Mariners visited the Yankees for two day games this year May 3 and May 4. One of those games was caught by Molina the other by Chad Moeller. Also I have a similar question regarding a Miguel Cairo card if anyone can help me there. This card was pulled from my first pack of 2008 Topps Stadium Club. The entirety of the pack is listed here. PTBNL once again won Spot the Sig! I will post standings later in the week. PTBNL didn't have anyone on base so the scores are basically unchanged except he has a runner on 2nd now. There is still time to get involved in the STS! bonus quesion by posting here. I am still hoping for at least one Phungo reader to pick Penn State. I hope to get to the Len Dykstra profile on Wednesday. Derek Jeter 1/1 receives no bids! check out this completed ebay listing. Is this a legit 1/1? I am not familiar with this seller and this is not an endorsement or otherwise. They do have a 99.9 rating w/ 2000+ auctions. which isn't perfect, but it is pretty good. Granted this auction ended at a bad time on the day after Christmas, but shouldn't any Jeter 1/1 even if it is part of a huge list of cards in milestones generate at least 1 bid. This particular card also represent number 1 in the series which one would think would give it some added cache. For less than 5 bucks including shipping somebody could have had a Derek Jeter 1/1 and not one person bid. Have 1/1 cards declined in significance that much? I hope everyone has recovered from their holiday festivities. Actually I hope everyone is in the middle of a week off. Unfortunately, I am not and will be returning to work after a nice five days off. Here is this weeks Spot the Sig! Auto which is good for a double to the first person who guesses it correctly. To get the walk or stolen base bonus, I am asking you to guess the winner and margin of victory in the game. The two teams are the USC Trojans and Penn State. To get the bonus you must pick the correct winner and by how much. Whomever is closest to the margin of victory gets the bonus. Example PSU by 35. Please have entries in by 11:00 AM (eastern) on January 1st 2009. Aaron Rowand was a big fan favorite during his short stay in Philadelphia. So much so that Topps appears to have used a shot of Rowand batting in Philadelphia on this O8 Topps card and photoshopped on the Giants uniform. But Topps didn't stop there. They were apparently appalled by the looks of the local fans and photoshopped them out. Check out the fans to the left and right of Rowand. On both sides near the top of the photo you see a person in a light blue top. going down pink shirt w/ white hat, person looking stage left, Red shirt. Everybody to the left of Rowand has a twin sitting about a half dozen seats down on the other side of Rowand. Here's to Topps Lazy PhotoShopping. I am also sending out the reminder that It is Sunday and the 12/28 Auto for Spot the Sig! will be posted at roughly 9:30 pm tonight. I received my 12 day of Cardmas gift from David of Tribe Cards and opened on Christmas day. As I have mentioned in the blog bat around and elsewhere, I am interested in collecting cards representing games I have been to. I collect primarily baseball. Consequently I have (or had) very few cards of players that I have seen play in the other sports. I let Dave know that I was interested in cards from a couple of football and hoop teams that I had seen. And he did a real nice job. Ok, I hope I got the categories right and everyone get ready to sing the song. Lets have a look. Thanks again to Dave. As you can tell, this took a lot of work and Tribe Cards got plenty of requests. This is the Boxing Day edition for the Phungo salute to the Philadelphia Sports Hall of Fame 2008 induction class. Today we honor Tommy Loughran, Fred Shero, and Stan Hochman. Tommy Loughran is the only one that actually is a boxer. He compiled a 96-24 record with 17 wins via knockout. He won the Light Heavyweight title in 1927 and was named Ring magazines Fighter of the Year for 1929 and 1931. Stan Hochman is also connected to boxing via a cameo appearance in Rocky V. He probably prefers to be remembered for his writing. Hochman is currently a sportswriter for the Philadelphia Daily News, I know Hochman primarily for his appearances on a local sport panel talk show “Daily News Live’. Hochman is a great tie to Philadelphia’s sports past and has incredible stories about the Phillies of the 50s and 60s. Hochman’s expertise is not limited to the field of sports as he can also give thoughtful commentary on subjects in the arts such as, literature, theater, food, and jazz. Fred Shero isn’t a boxer but he certainly can be linked to fighting. He was the head coach and leader of the Philadelphia Flyers from 1971-1978. The Flyers of the era were known for their rough and tumble style. Shero's legendary “Broad Street Bullies” won the Stanley Cup in both 1974 and 1975 . The 1976 team, which bested the Russian Red Army team 4-1 in a much remembered game, were also honored in a Simpsons "Treehouse of Horrors" Episode . I am late again but feel good about posting this on Christmas Day. This is my second blog bat around, my first is posted here. This is my Grandfather's first baseball glove. He gave it to me as a birthday present in my early teens. My grandfather said he bought it in 1941. I never thought much about this till his death in 1997. It then occurred to me that my grandfather would have been 26 in 1941. That's hard to imagine. My grandfather was an avid baseball fan and by accounts a decent athlete. I don't really know if sporting equipment was readily available in rural Pennsylvania in the first half of the 20th century. I gather in 1941 everyone, my grandfather included, was coming out of the great depression. Prior to that a person of his means probably had no way of earning the money to buy luxury items. 1941 is also the year that Ted Williams batted .400 and Joe DiMaggio had a 56 game hitting streak. I don't know what constituted a media frenzy in 1941, but I am curious if the baseball glove may have been a popular item that summer due to the accomplishments of DiMaggio and Williams. The following summer my own father was born, the first of 7 children. Perhaps back in 1941, in that brief time between the depression and and impending fatherhood, my grandfather was able to enjoy a carefree summer on the sandlot. My Grandfather's first baseball glove. The pride of my collection. Happy Holidays to everyone from Team Phungo. This is the second installment of the 2008 World Champ tributes. In this series I am chronicling the key players from the 2008 Phils and pairing them with a Phil from the past. When I wrote up Cole Hamels a few weeks back, I made the obvious comparison between Hamels and Steve Carlton. It's not really fair, Carlton is a Hall of Fame pitcher with 300+ career wins. Hamels is 24 with less than 3 years of Major League experience. Today I make another lofty comparison. Ryan Howard and Mike Schmidt. No, they don't play the same position and Howard will never be the defensive standout that Schmidt was. But each of them was the big home run hitter for their respective World Championship teams. On the back of the above Schmidt card one can find that in 1978 he was 29 years old, had 169 homers and a career .256 average. Ryan Howard has just turned 29, he has 177 Home Runs and carries a .279 carreer BA. RBIs Schmidt 474, Howard 499. Those numbers are pretty darn close. At 29, Mike Schmidt still had the bulk of a Hall of Fame career in front of him, I hope Ryan Howard does also. What the heck is going on with the photoshopping on this Andre Ethier card? He has a 61 on the front and a 16 on the back. It's not a reverse negative. Looks to be a photoshopping oversight. The B&W photo on the front makes it hard to tell if that is photoshop or a the real photo. According to Baseball-Almanac, Ethier has only worn #16 in the majors. This may be the first time I have referenced Baseball Almanac here and I have added a link to the Almanac within the Around the Horn sidebar. I generally use Baseball-Reference or Wikepedia for quick research, but the Almanac is a good reference for uniform number and some other information. Today's reader salute goes out to fellow Phils Phan PTBNL who had a big 3 run inning in the Spot the Sig! contest Sunday. PTBNL was at a cosiderable advantage, he had just posted a Frank Robinson auto at Auto-matic for the People - so not only was he familiar with the auto it was likely fresh in his mind. I already had the STS! auto mapped out, and considered withdrawing the Robinson, but decided to leave it in the contest. PTBNL has been an active participant in Spot the Sig!, often getting his guess in early on Sunday Nights. He was also gracious enough to come up w/ some suggestions for places to go when my girlfriend and I took a recent mini-vacation in Virginia. Thanks PTBNL and Phungo Salutes you! My favorite PTBNL entry at Auto-Matic for the People was for a Pat Burrell Auto. The post is definitely worth a read, it is both heartfelt and interesting. As I noted in my blog bat around post several weeks ago, I like cards that commemorate games that I have attended. 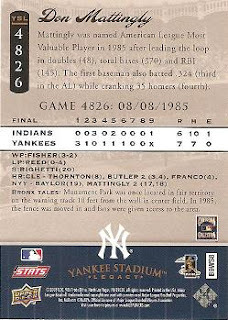 The date noted on this card is opening day of the 2004 season. 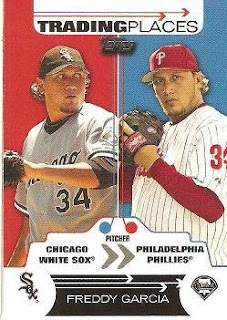 Unfortunately the Phils lost the game, but I still enjoy the look of the 2004 fleer Authentix cards. There is a bit of shiny chominess (didn't come through in the scan) which helps the card look a little sharper. Pat's days in Philadelphia are likely over, I hope that he goes somewhere he can continue a productive career. He's had his ups and downs in Philadelphia, but he is a World Champion an nobody can take that away from him. Back to this weeks autos. The Frank Robinson card is part of a Hillshire Farms series produced in 1999. I first became aware of them via a Dayf post also on Auto-matic for the people. And he is correct, I believe you can likely pick up each of the Hillshire farms autos for under 10 bucks on ebay, possibly even 5 including shipping. As for Dallas Green, he came and spoke at the Chester County Historical Society a few years back. I only remember two things Dallas said that night, one was that he completed a masters degree at University of Delaware and the second was he said "Wayne Gomes is not a closer". He was right. PTBNL as I mentioned earliar had a big inning and I am going to have to sort all this out. First up he got the single for getting the Frank Robinson auto so Utley Drives in Victorino. This is followed by Ryan Howard getting a big triple, must of been one of those towering pop ups that bounced off of the top of the wall (driving in Utley)- And then Howard comes home has the cutoff man throws wildly to 3rd base as PTBNL gets the Red and Green Bonus. 3 runs for PTBNL. There was one other bonus to hand out as Night Owl found the 1974 John Ellis card. The Night Owl crew is doing a good job of working on manufacturing a run, coming through on their third bonus question. Night Owl was also inspired to create an amusing post on the cartoons of 1974 topps. Definitely check it out. With the bonus, the busy Matt Kemp has stolen 3rd. I do have a couple of questions for this weeks winners. 1) PTBNL, you sounded defeated but went back in there and figured out the Dallas Green auto, how'd you come up with it? searching ebay or going through old cards for facsimile autos? and Night Owl, did you know that cartoon was from 1974 topps?. Every time topps has the cartoons they are different but I don't know if I could pick out one year from another based on just the toon portion of the card. I hope everybody enjoyed this weeks seasonal Spot the Sig! and it helped to get everyone into the holiday spirit. Next week will probably be a lot more basic. Stop back Sunday night for the next edition of Spot the Sig! We have a dual Spot the Sig! for this week. The first is on a card. I think this one is pretty easy and it is good for a single. But since I am in a good mood, base runners advance 2 bases on the single for whomever correctly guesses this softball of a sig. The second Auto this week is on a baseball. I think this one is tougher and it is good for a Triple. To get the Stolen Base/Walk Bonus guess the card number the cartoon comes from. Whoever gets closest to the number gets the bonus. If somebody picks the exact number, only the first correct answer gets the bonus. The painted over section is the players name - that would have just made the bonus to darn easy. oh and there is a second bonus to anyone that can pick out the theme between the two Autos. Yesterday, I posted regarding a Sox or No Sox style competition between three retail packs of UD Masterpieces. Each of the three packs is from a different sport, Football, Hockey, and Baseball. Both PTBNL and Sooz picked Baseball, I hope they are right. That's where I want to get the best cards from. Let's see what happens. The scoring for a pack is as follows: Any Hall of Famer +2, Any Phillies or Orioles +1 Each. Vikings or Eagles +1, Flyers +2, Mets, Packers, Devils and New York Rangers (Hockey) all minus 1. Oh and If there is a hit, auto, serial #d, Game used whatever +2 to +10 points depending on what it is. Pack with the most points wins. Four blah rookies, Royal is the only one to make an impact. Simpson is the "hit" and he has gotten 1 stinkin catch all year. No Vikings, Eagles, or Packers no points. I would have awarded 1/2 a point for Simpson had he done anything this year, but 1 lousy catch. I posted the reverse side of the Lord Stanley card, because I like what Upper Deck has done with both the Football and Hockey cards. They have an inset of the front photo with the artists name listed next to the picture. This is a nice touch, which I hope they carry over to baseball in 09. I posted the Mattingly card because I found it the most interesting. This is one of the few YSL cards that I have come across where the player on the photo had a significant contribution to the game. The Yankees won and Mattingly had two home runs. Those dingers were just two of the 35 that Mattingly had during his MVP season in 1985. Three stinkin packs No Phils, No Vikings, No Eagles and No Flyers. The pack bust was good for a bonus base in Spot The Sig! for anyone who could guess the winning pack. Unfortunately Hockey was unloved so noone will get the bonus. But have no fear....Your Sunday is not ruined. You still have this weeks auto to look forward to. The STS! will be up at 9:30 PM Eastern. It's been a tough week for Mo Cheeks and the 76ers. Cheeks has always been a fan favorite in Philadelphia but, unfortunately, that was not enough to keep him here as the Head Coach of the Sixers. Maurice Cheeks, however, is a member of the Philadelphia Sports Hall of Fame due to his playing career. He was the point guard for the 1983 NBA championship team and the two other teams that played in the Championship series (1980 and 1982). During Cheeks 15 year career (11 with Philadelphia) he racked up 2,310 steals, which was the NBA record when he retired in 1993. Cheeks also left the game as the #5 all time Assists leader. The 76ers retired Maurice Cheeks number 10 in 1995. Outside of Philadelphia, and certainly in Portland, Cheeks is likely best known for coming to the aid of Natalie Gilbert when she stumbled singing the National Anthem. The video is worth watching again. Perhaps it is the initimacy and solitude of watching on a PC instead of on television, but I actually got chills watching the video five years later. Towards the end Natalie recovers and finishes quite nicely. I rembering Cheeks mentioning in an interview that as he walked over he wondered to himself if he remembered the words. The Anthem performance that night was prior to a playoff game between the Portland Trail Blazers and the Dallas Mavericks. While Cheeks could lend an assist with the Anthem, he couldn't provide enough help for the Trail Blazers to stop Dirk Nowitzki who scored 42 points in leading the Mavs to a 115-103 victory. Herb Magee is the head coach at Division II Philadelphia University where he has coached for 40 years and tallied 850+ victories. This ranks Magee 2nd amongst all active college coaches (Don Meyer - Northern State, SD). His website also has a link to a plug by Bobby Knight. I like Herb just because he comes into a bar near my home for Eagles games early in the season. I have never had the guts to go up and say hi, but he does seem like a real decent guy. Spot the Sig! Bonus Base! Since it is cold in miserable here in the Northeast we are going to be adding a small bonus to the Spot the Sig! Contest this weekend. Here is a chance for somebody to steal a base in the Phungo STS! contest. 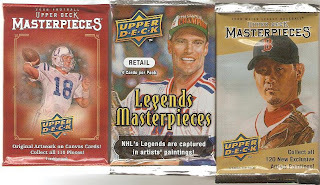 Tomorrow we are going to be featuring a Masterpieces Pack Bust. I will be opening 1 pack each of Hockey and Football since the Flyers, Vikings, and Eagles are all playing. And I will also open a pack of Baseball - because we are really about baseball here. And we are going to play a variation of Sox or No Sox. Here are the particulars. Any Hall of Famer +2, Any Phillies or Orioles +1 Each. Vikings or Eagles +1, Flyers +2, Mets, Packers, Devils and New York Rangers (Hockey) all minus 1. Oh and If there is a hit, auto, serial #d, Game used whatever +2 to +10 points depending on what it is. Pack with the most points wins. The football and hockey packs are retail. The baseball is from a blaster. To get a free base (or walk if you have the bases empty) in STS! simply pick the pack that wins. Two contestants can pick the same pack, if that pack wins they both get the free base. And if you haven't gotten involved in Spot the Sig! click here for more info. You can enter anytime and with the Masterpieces Pack Bust you could get a man on base even before the next round starts! Today’s Phungo Readers Salute goes out to a couple of Mets fans that are good enough to stop by here. I don’t know what it is but despite the fact that we are sending out largely Phillies content, we have a couple Mets fans that visit pretty consistently. I really enjoy Sports Locker - JRJ posts a lot of interesting information on cards and memorabilia. Yes He is a fan of the Mets but we will forgive him. Sports Locker has a background in the Jersey area so there is also the occasional Philadelphia related post. The Mets stuff and too bad, but the Cowboys info get a little hard to take. Mark runs Stats on the Back and is attempting to collect a card of every Met. Best of luck with that, I think some of those late 70s teams may have went through a lot of players that never got cards. He is also an active member in the Spot the Sig! contest and has scored a run to move into a tie for first place. Finally I want to mention Paul’s Random Stuff, who occasionally drops in a comment here. This sometimes confuses me, since my name is also Paul and I am easily confused. PRS features a nice array of Mets cards, info, and lots of Autos. There were a couple of different directions I could of gone here, I will save both Phils and Mets fans some anguish and not post a Billy Wagner card. Instead I will post a card of a different reliever who may be the only player to contribute to both a Mets and a Phillies World Championship team, Tug McGraw. These two cards are interesting when placed side by side. The Photos both feature Tugger in roughly the same pose, and they both appear to have been taken at spring training facilities. What really separates the two pictures is the uniform. Regardless of the team he played on, I think most people think of Tug McGraw as one cool dude. I saw McGraw speak once at a local historical society. He was very funny and amusing as one can imagine. It’s unfortunate that McGraw died so young, but I am glad I was able to enjoy his career and his humor. Tug McGraw – great guy, something both Mets and Phils fans can agree on. Tony Gwynn was inducted as a first ballot Hall of Famer in 1997. The honor was much deserved. 3141 hits, 319 Stolen Bases and a career average of .338. The batting average is the highest among all major league players whose careers started after World War II. During the 1994 season Gwynn batted .384 for the year, 3 hits shy of .400. He led the league in batting average 7 other times. Pretty impressive. The 15 time all-star played his entire career with the San Diego. The Padres have gone to only two World Series', Gwynn was a member of both teams (1984, 1998). I love these Topps Pristine cards, with players in their college unis - this year Donruss Threads also has an insert series dedicated to great players representing their colleges. This Gwynn card also mimics the 1983 topps set. Gwynn has returned to his alma mater as their baseball coach. These days Tony Gwynn Jr is playing baseball in the Milwaukee Brewers organization, getting 130 games with the big club over the last 3 years. Gwynn also has a daughter Anisha Nicole who is an R&B artist. Her album is called "19", Gwynn's Uniform number. On the first song clip you can hear Tony congratulating Anisha on her 19th birthday. Tony Gwynn is making a bit of a buzz over at Punk Rock Paint where they have recently featured the rare 1971 Topps Gwynn card which was discovered in Al Copones Secret Vault. And Cardboard Junkie is featuring a related contest. As you probably know Steve at White Sox Cards has been very active on the trade market lately. And Team Phungo is very happy to have worked out a deal with WSC involving some White Sox some Phils and a bunch of stuff on my need list. Basically I had a couple ’59 White Sox looking for a good home and Steve checked on my want list and we expanded the deal from there. Steve sent out a team bag full of Phils which included lots of stuff I needed. And another bag full of cards to help out with my set building. The cards above are among the highlights. I didn't pick up any Baseball Heroes cards this year and was very happy to get the Carlton/Santana card. The Schmidt is the first 86 Mini added to the Phungo collection. I also let Steve know that I enjoy vintage cards if he had any, The Bob Lemon card was among the vintage he sent. I like the '78 manager cards - probably had this one when I was a kid - glad to have this one back in my collection. The set builder bag had cards I needed from 08 Topps Series 2, 07 Bowman Heritage, and 07 Masterpieces. I was very happy to knock a bunch of those sets off of my lists. Thanks a bunch for the cards and keep up the trading – it’s like getting a blaster in the mail – only I want all the cards and it’s a heckuva lot cheaper. Mark from "Stats on the Back" correctly identified Kevin Kouzmanoff as this weeks Spot the Sig! subject, and Mark also correctly guessed that my girlfriend, Jo, works in Russian. Kevin Kouzmanoff, which as Sooz from "A Cardboard Problem" has pointed out, is not really Russian. He is Macedonian. Kouzmanoff was called "the Crushin Russian” early in is his career, perhaps to correct this misrepresentation he has more recently been dubbed "the Mashin Macedonian". We do make note of all things Russian in our home so Kouzmanoff quickly became a house favorite, despite not really being Russian - there really aren't any Russian ballplayers, Eastern Europe is more of a hockey hot bed than baseball. It really isn’t clear what Kouzmanoff’s career ceiling is going to be - Hitting a Grand Slam versus your first career pitch is certainly a mixed blessing. It has made Kouzmanoff an instant baseball celebrity, but has set high expectations. While the man has considerable power, His 23 homers in 2008 is pretty darn good considering he played half his games in PETCO park. On the other hand he is a bit high in the strikeout area and finished the season with an OBP below .300. Kouzmanoff is 26, and I tend to believe that he can cut down on the strikeouts and gain even more power over the next couple of years. For more Kevin Kouzmanoff information keep your eyes on A Cardboard Problem - there is a rumor of a feature on today's hero at some point in the near future. Stats on the Back has stretched a double into a triple on the bonus and driven in a run to tie PTBNL and Cardboard Junkie for the STS! lead. Thanks all for your participation, Next Spot the Sig! will be up on Sunday Night. This weeks Spot the Sig! is a sort of personal recognition to someone very special to me – no it is not the player who signed the card above. This is for my girlfriend Jo. In addition to putting up with me and all the nuisances related to my hobbies - sports, music, and card collecting – AND holding down a full time job AND keeping our lives in order, she has been diligently working on her Master’s degree. Recently she has completed her Master’s Thesis, I am extremely happy for her and she should be proud of her accomplishments also. I have enjoyed following her quest and I only wish I could have been more supportive. I feel lucky for the moments I was able to make contributions and provide feedback. Now that you have successfully finished your Master’s program, Jo, I congratulate you. I am sure all you folks that have been participating in STS! May be asking what does this little window into our personal lives have to with this weeks contest? It is the bonus Question. Jo’s Thesis involved collecting data from students learning a foreign language. The bonus question is: What was the language? Yes, the language is somehow connected to this week’s card. Signature is good for a Double, Bonus good for a Walk or Stolen Base. Night Owl - Dodgers - Matt Kemp triumphantly advances to 2nd. A Cardboard Problem has gotten the Yankees into the game, they remain on Deck, but I would never count out the Bronx Bombers. Bob Feller won 266 career games, every one of them with the Cleveland Indians. He was also a member of the most recent Cleveland Indians team to win the World Series in 1948. The 266 Career wins is an even greater accomplishment when you consider that Feller gave up 3 prime years of his career for Military service. Those three years from 1942-1944 were sandwiched between 25 and 26 Win season for Feller. Feller is frequently outspoken and I admire his convictions. Last year he was in the booth for a very entertaining inning or two during the American League playoffs, as I remember he did not hold back on any criticisms of the current state of baseball or the disposition of the games players. I will always enjoy the old black and white films of Feller throwing his fastball “racing” against a motorcycle in order to time the pitch. I couldn't find the motorcycle video but I did find a video of him throwing his fastball through some contraption that clocked the pitch at 98 mph. Bob Feller autographs, are in pretty high circulation on Ebay. You can also acquire one through the Bob Feller Museum , located in Rapid Robert’s hometown of Van Meter, Iowa. The charge is $20 although right now they are running a discount that brings the price to $16.20. I couldn't figure out the shipping charge, but I would imagine that it would bring the item back into the $20.00 range. Twenty bucks for an autograph of a 90 year old Hall of Famer seems like a decent deal to me. Today's readers appreciation is for Night Owl Cards. Sometimes when I am not quite ready start working in the mornings I sneak over to check out what is going on in blogworld. Night Owl Cards is great for this because there is likely to be a posting composed while manning the graveyard shift, thus I have something new to read each morning. Night Owl covers the primarily the Dodgers teamwise and he can also cast some great riffs on the vintage cards - lots o good early 70s stuff. 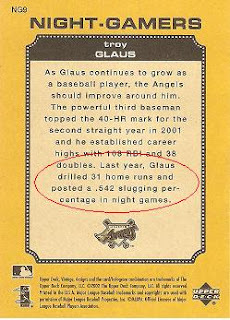 But best of all Night Owl Cards has an interesting niche posting on Night Cards - Brilliant Concept - Night Cards Posted Over Night. In 2002 when UD Vintage ripped off the iconic 1971 Topps cards they produced a couple of interesting inserts sets called "Day at the Park" and "Night Gamers". I love 71 Topps, and also enjoy the UD Vintage version. One of the cool things about the two insert sets is they give you informationn on the players performance in Day or Night games depending on the set. Oh and I should also point out that Night Owl Cards is in contention to be added to the Heavenly Seven. Night Owl Cards, Team Phungo Salutes and Thanks you - keep up the good work and we look forward to a new post tomorrow morning!